Here you will find links to workshops and events that are of interest to the Geoscience in Two-Year Colleges community. On the Cutting Edge runs a suite of workshops every year aimed at providing geoscience faculty with professional development around both pedagogy and content. 2YC faculty are encouraged to participate in these opportunities. Check the Cutting Edge website for upcoming workshops, webinars, and other events that you might be interested in being a part of. There are a number of technical sessions and events planned for the 2013 Geological Society of America Meeting in Denver, CO that will be of interest to two-year college faculty. This workshop will bring together faculty, administrators, and education researchers from across the country, to share successful programs and activities for supporting the success of all students in geoscience at 2YCs, both in and outside the classroom. We also welcome participation from representatives of professional societies who can contribute to this synthesis. This workshop in conjunction with the 2013 ASLO meeting is a follow-on to the 2012 summer workshop on preparing 2YC students for the geoscience workforce or to transfer on for further study. This workshop will focus on issues specifically related to preparing students for careers in the ocean sciences. Participants in this SAGE2YC workshop will learn about successful 2YC college transfer and geotechnical workforce programs and practices, effective student research and internship programs, and geoscience career resources for 2YC students and faculty To register for this one-day workshop ($25) you must also register for one-day ($40) or more of the 2012 Geological Society of America Annual Meeting. There are a number of technical sessions and events planned for the 2012 Geological Society of America Meeting in Charlotte, NC that will be of interest to two-year college faculty. 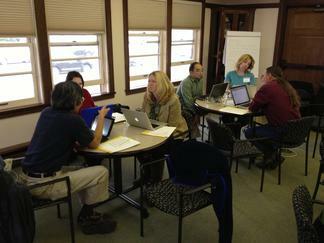 Participants in the 2012 Supporting CC Faculty in STEM workshop at Carleton College. The project brought together 25 educators representing 13 disciplines who addressed the isolation of community college instructors and their lack of engagement with discipline-based professional associations and NSF-funded projects. Materials created at the workshop will be hosted on the website and will include materials that can be used within each discipline (ready-to-go activities for faculty development and links to existing resources to improve undergraduate education and faculty professional development) as well as shared information so that we can continue to learn from one another across disciplines. 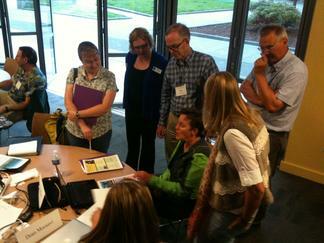 Participants at the 2012 SAGE 2YC workshop gathered around an exhibit at the Share Fair. This workshop is a part of the Supporting and Advancing Geoscience Education at Two-Year Colleges (SAGE 2YC) project and brought together faculty, administrators, and representatives of professional societies to address the challenges and share successful programs and activities for bringing students from two-year colleges into geoscience careers. American Geophysical Union Headquarters - Washington, D.C.
A planning workshop for a new American Geophysical Union initiative to support two-year college faculty and students engaged in student research in the Earth and space sciences. A listing of talks and posters relevant to two-year college faculty that took place at the American Geophysical Union Meeting in December 2011. Technical sessions and events of interest to two-year college faculty at the 2011 Geological Society of America Meeting in Minneapolis. 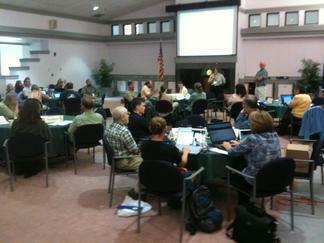 Image of participants in the June 2010 Planning Workshop at NOVA Community College.